Imagine this retro bath bar light with some silver starbursts or another reto shape or pattern stenciled on it like Trixi and Jon (and since then, quite a few others) used in their retro bath remodel. In lieu of using a fancy wallpaper or rock wall on this idea board, a large, plain mirror covers most of the vanity wall and provides plenty of opportunity for light to bounce around the room. This Kohler bath faucet is simple and modern, but its compact design and chrome finishing work well with the retro aesthetic. 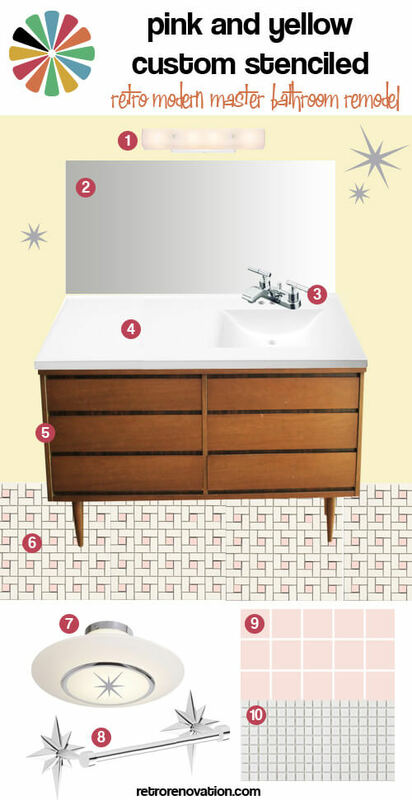 Like both of my previous idea boards, this affordable sink/countertop combo from St. Paul Home Products seems like just the thing to top my retro dresser made into a vanity. The retro dresser I scored on Craigslist for a mere $25! It has just the right look and measurements for my retro modern bath remodel project. This pinwheel tile floor doesn’t come in white and pink, that would have to be customized by me. My plan? To purchase the pinwheel tile in black and white, then purchase some unglazed ceramic pink tiles, pop out the black ones and painstakingly substitute the pink tiles. It would be a lot of work, but worth it in the end! I’m loving the shape of this flush mount chrome rimmed lamp. I think it works with both the modern and the retro elements in the room, and I could further customize it with a starburst stencil or two on the bottom of the light. Here, once again is my all time favorite towel bar — the star back plate towel bar from Rejuvenation. 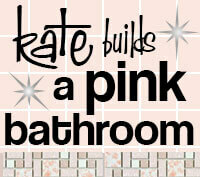 Once again, I’m hoping B&W tile has a retro pink for my shower wall tile! A classic retro choice, white 1 x 1 inch tile mosaic for the shower floor — hey it must be authentic since It is currently a part of my original 1962 master bath. 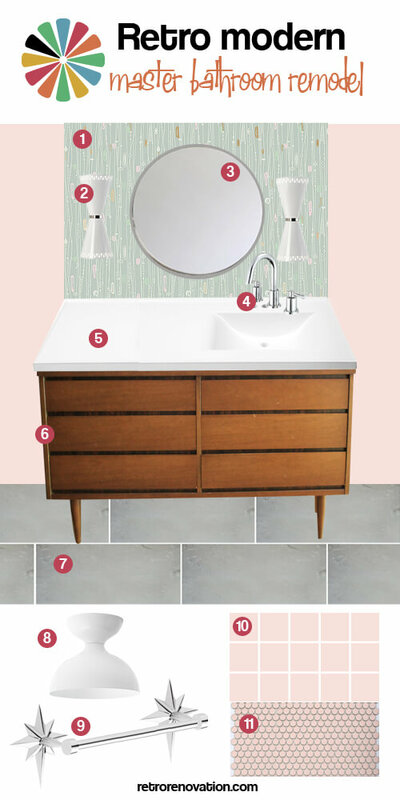 Painting the walls a cheery yellow might not be the end all be all for this retro modern master bath remodel idea board. I could possibly also stencil an atomic starburst or other shape (or perhaps even freehand something) on the wall to add more interest. The key to this look is taking affordable parts and customizing them to look like pricier products. Shhhh! — Don’t tell anyone! It will be our secret! What retro motif would you stencil on the walls and light fixtures? The classic starburst? Something more geometric? 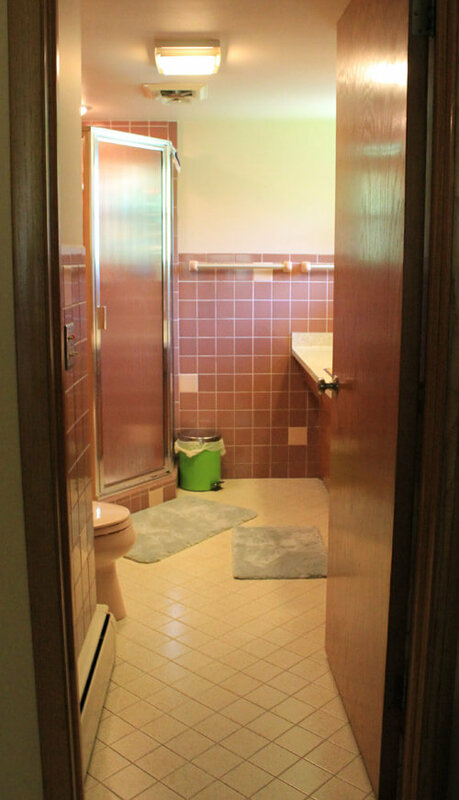 I’ll chime in on the yellow and pink as a person who had a pink and maroon bathroom that we painted yellow. We went through three shades of yellow before we found one we liked. (We actually ended up mixing it ourselves because we couldn’t find the right shade. We mixed a canary yellow with light grey.) We even checkerboarded the ceiling with a merlot paint to tie it all together. It looked really nice, but it always bothered me that it didn’t go with the rest of the house, which is painted in purple, burgundy, merlot, a couple of browns and sage. We ended up repainting the yellow with a sage this spring (and redid the checkerboard). Much happier with it now. Our fixtures are all white and we accented with white towels, floor mats and shower curtains. I have to say the boards you are putting up here and very helpful, as we’re in the process of saving to renovate our full-height dormer (which is just a large empty room that we don’t even use). We’ll be making it a master suite and adding a bathroom up there. We’re trying to figure out how to add a space that will look like it came with the house, rather than something that looks like it was adding in 2012. Kate, I think the fact you have your sink all the way to the right of the vanity means that you should go with the full-wall mirror. 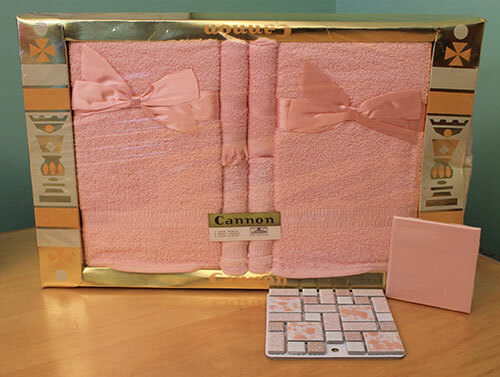 The other mood boards, where there is a framed mirror centered, seem “off” to me. Hey, I know this is an outside wall but maybe: A triple-mirrored medicine cabinet? Although you say you have enough storage…. and insulation is important where you live… never mind. Also, if you do full width mirror maybe you could get it etched? Not sure how spendy that is. In one of my bathrooms I have a vintage mirror with etching spanning a 48″ vanity (as I recall) it is really cool. And, so nice to be getting all these comments on your cool mood boards. I am SO HAPPY to have you here, Kate!! !